You often hear "Walk, it's better for the environment", but is that actually true? If I walk 5 miles instead of taking say a public bus, given that I now will need to replace the energy I spent walking with food which has a cost on the environment to grow, which would really be more environmentally friendly? Given that the bus would be running anyway, so the only cost is hauling my extra weight on it. How do electric cars compare? Cycling would cost me less energy, but then there's the wear and tear on my bicycle which again has a cost on the environment that is presumably greater than the food cost. Roller blades seem to last a long time (or is that because I rarely used mine?) so could they be more efficient? Would sailing be a more environmentally friendly mode of transport than walking? Again there's wear and tear on boat parts, but over a long distance humans would need a considerable amount of food and fresh water. This question is addressed in a paper by Shibahara et al, 2013. They don't discuss walking, but they do discuss bicycling, which I suppose is a more realistic method for commuting (for example, I bike the 8 miles to work but I've never walked it). The authors analyzed taxi, gas cars (GV), electric cars (EV), bus rapid transit (BRT), light rail (LRT), city-center shuttle buses, and bicycle (and battery-assisted bicycle, which I am going to ignore, because I think it is silly). 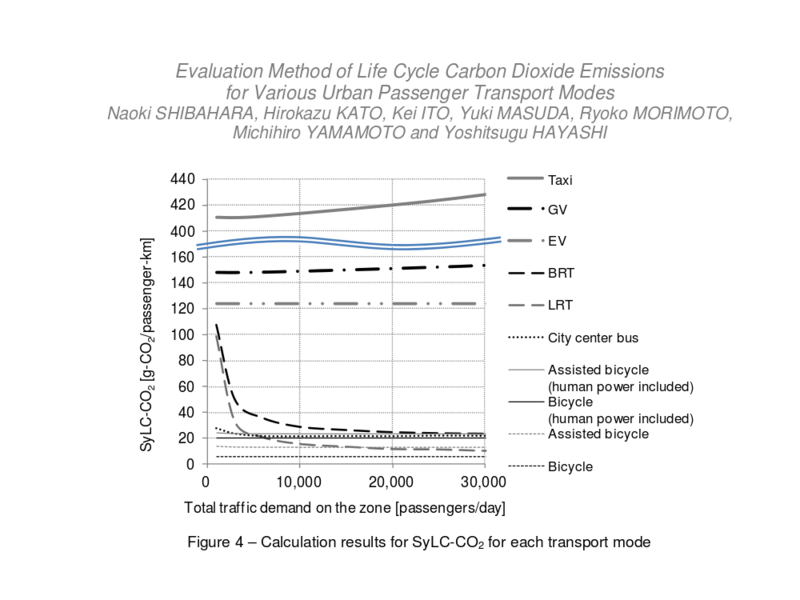 They accounted for total system life-cycle carbon (SyLC-CO2) usage, including the cost of making bike paths and rails and roads and the farmland CO2 costs emissions needed to power the human on a bike. The result is that taxis are unspeakably bad, gas cars go from 145-155 as traffic increases, electric cars are a little better in the 125 range. BRT and LRT have rapid exponential decreases from ~100 with low traffic to 25 for BRT and 15 for LRT at high traffic. City center have a slight decay from 30 to 25 as traffic increases, and bicycles a near constant 20. So the conclusion is, bicycling is much better than cars or even electric cars, better than buses even in high traffic areas, but not as good as a light rail in the most densely populated areas. I would suspect that walking is similar to biking, maybe even better. The calorie demands would be similar, more paved sidewalk would be needed due to slower speed, but not manufacturing bikes would save you some carbon. But the time it takes to walk more than a couple miles is pretty prohibitive, so it isn't a reasonable transportation alternative in many cases. Canoe! Seriously; depends where you're going. On moving water, when you're not paddling, it's gravity powered transportation. When you do paddle, there's often very little air resistance while you push & pull your weight around without much friction. Works well for me. Even with a heavy load. Walk. And probably naked [*]. [*] A grape leaf may be deemed advisable for decency. Are electric cars as environmentally friendly as we think they are? What kind of nuts are eco-friendly? How do word processing on a laptop and writing with pen and paper stack up sustainability-wise? How environmentally friendly is the production process of vitamin B12 supplements?